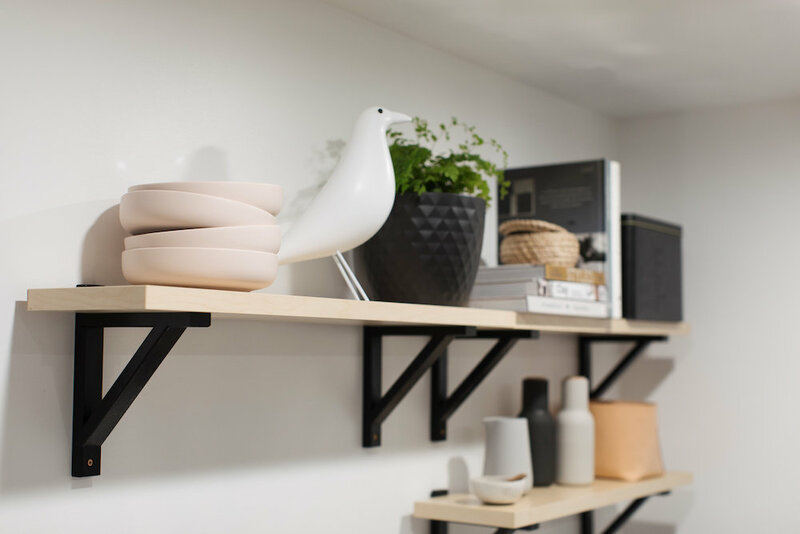 I’ve been working away behind the scenes on a little secret project – creating an office space for Style Curator! 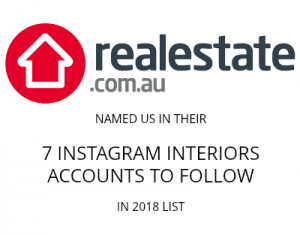 With a growing team and a second baby on the way, I’ve outgrown being able to work from home and cannot wait to have a dedicated creative space. I just finished the first part of this project, which was to create a shared kitchen space. 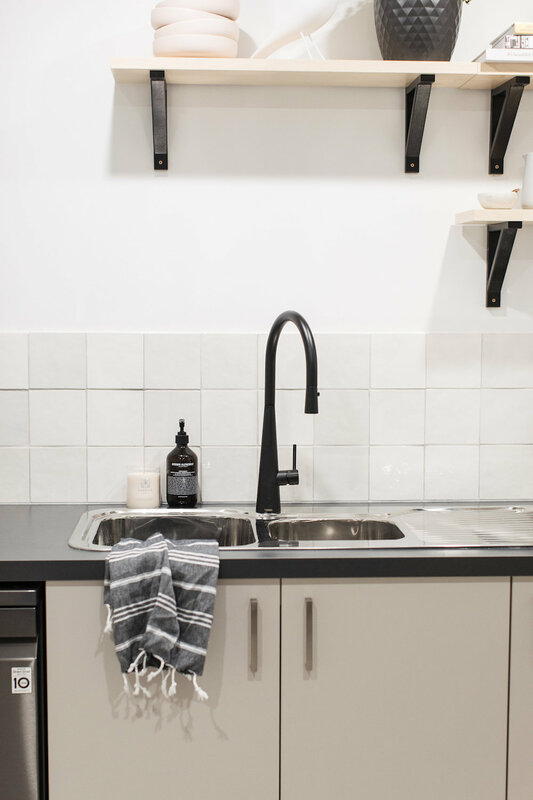 The kitchen itself is fairly basic but I added design interest with a handmade square tile splashback, matte black tap and open kitchen shelves that I can continually change the look of with different kitchen décor. 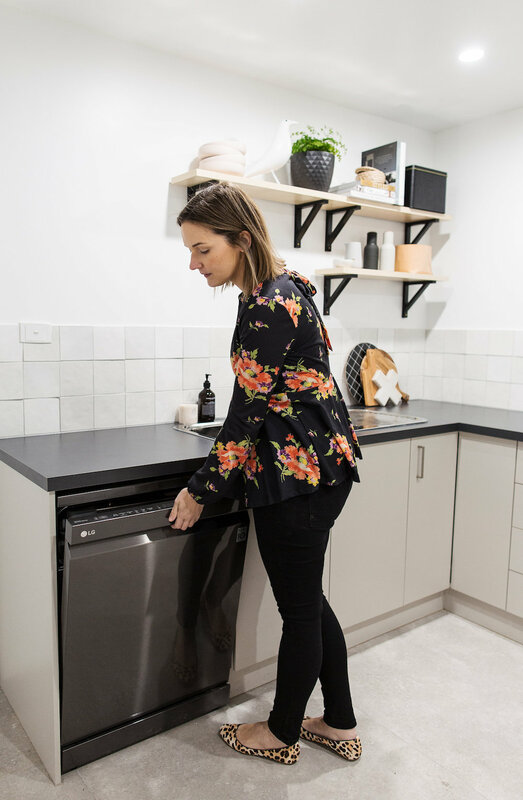 I was lucky enough to receive the new LG QuadWash dishwasher for this space, which certainly adds style and function, and today I’m reviewing this product for you! The first thing that struck me about the machine was its sleek, minimalist design and the black stainless steel finish (also available in stainless steel but I’m obsessed with black). I could see this dishwasher looking right at home in a luxury designer kitchen! The micro LED touch button display is discretely hidden on the top of the door so no buttons or lights are visible when the machine is closed, adding to its sleek appearance. 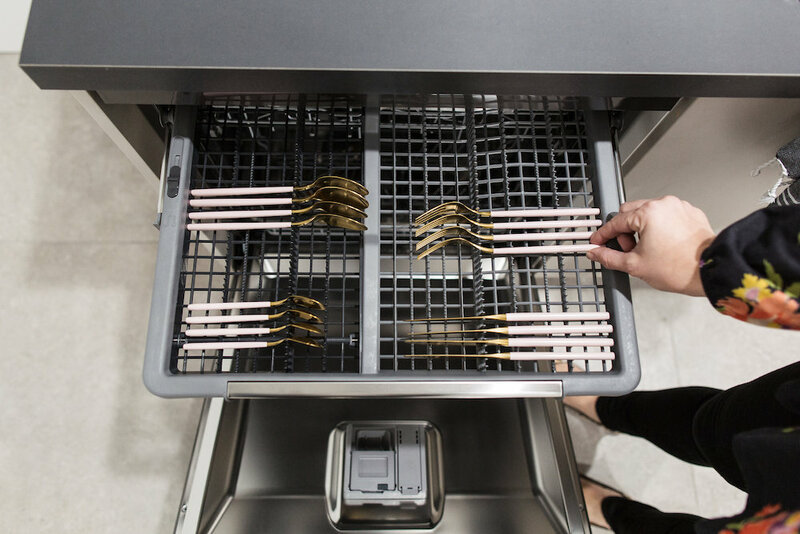 Inside the machine there are more design features to love, including the height adjustable racks and folding tines so you can easily configure the dishwasher to suit your needs – from large pots to lots of small glasses etc. It’s when you turn the dishwasher on though that you notice its key benefits. The QuadWash gets its name because it cleans from multiple angles. The arm has 4 blades that spins both clockwise and anti-clockwise, while the 2 oscillating spray nozzles deliver jets of water into every nook and cranny, achieving a superior clean every time. But with an Inverter Direct Drive Motor that has fewer moving parts than a traditional motor it does this quietly and efficiently. There’s also a Dual Zone Wash feature, which allows you to vary the water spray intensity to the upper and lower racks. That means you can gently clean your delicate dishes while power washing dirty pots and pans all in the same cycle. And if you only have a few items to clean (like we’ll often only have several coffee cups and plates to clean at the end of each day) there’s a Turbo Cycle which cleans lightly soiled dishes on a short 59 minute cycle. Similar to the LG washing machine I recently reviewed, this dishwasher also has SmartThinQ technology so you can download new wash cycles, create personalised settings or diagnose problems and troubleshoot issues from your smartphone. To be totally honest, I’m yet to find any cons of this product. I dislike my dishwasher at home because it has a cutlery drawer, which reduces the size of the other racks – making the machine practically unusable. Despite this machine also having a cutlery rack (rather than a cutlery basket), the size of the glass and pot racks haven’t been compromised so this hasn’t been an issue. This is because LG dishwashers offer more space and technological solutions than other brands in the market. The other con that usually makes me decide to wash by hand over a dishwasher are the long cycles and amount of water they consume but the Turbo Cycle option is really quick and water efficient. The LG QuadWash dishwasher retails for $1549, which does position this product in the upper end of the market (LG has washing machines starting from around $700). 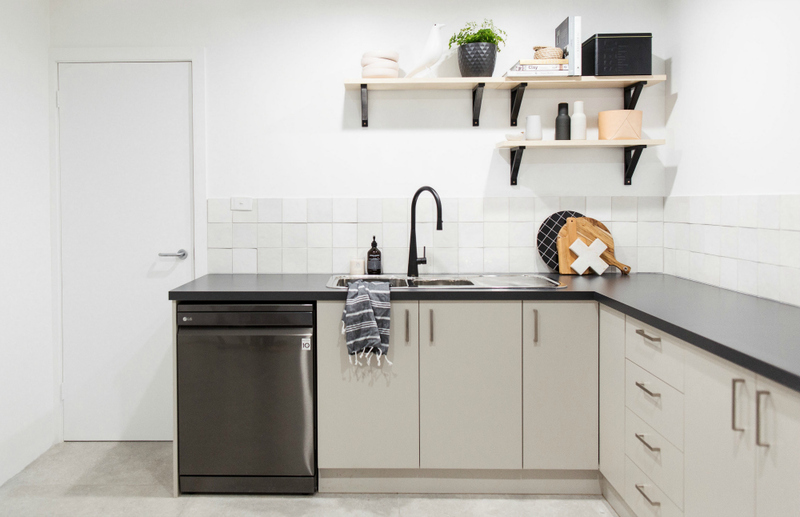 For a powerful, sleek and reliable dishwasher that comes with a 10-year parts warranty, and is loaded with technology to make life easier, it’s a great product that I’m very happy with. 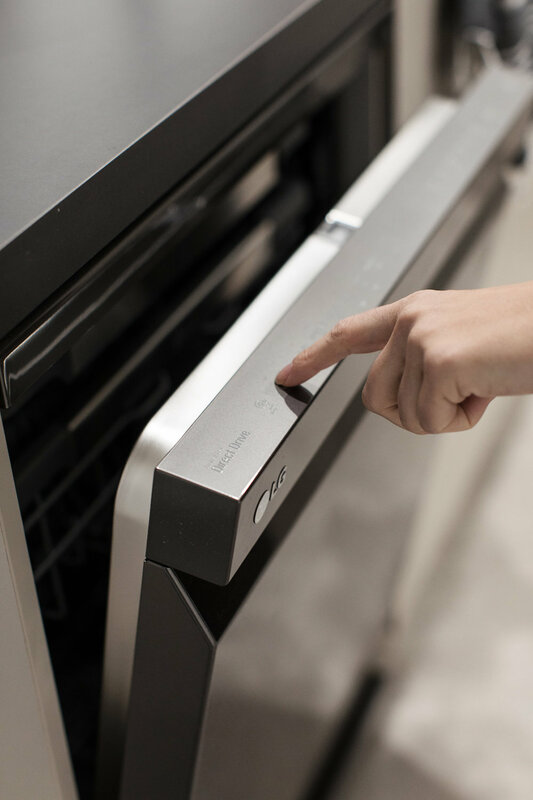 I never thought I’d get too excited about a dishwasher but LG have packed so many features into this sleek machine that it’s hard not to be impressed. 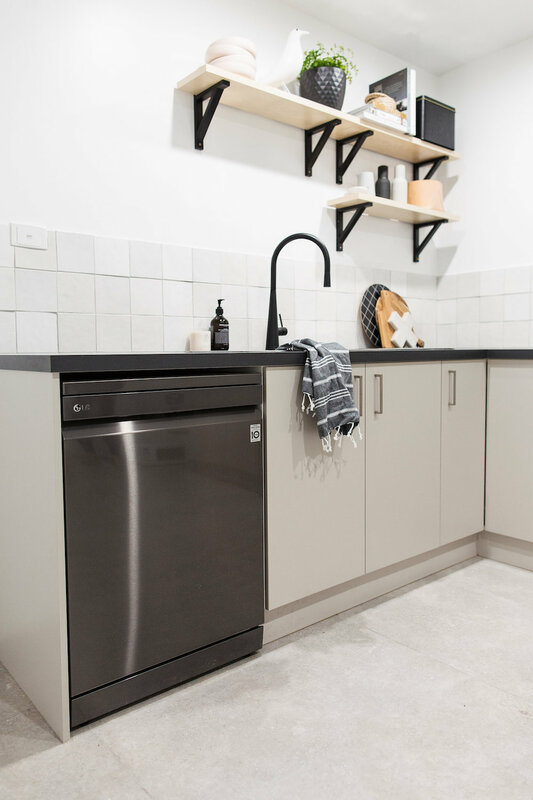 Function and design are the two biggest things I consider when picking any new appliance and the QuadWash certainly ticks all the right boxes – especially the way it cleans from multiple angles so you don’t get the issue of running a cycle only to find the dishes are still dirty! More than anything I love the ultra-clean line design of this dishwasher, which looks elegant and modern, and would fit into any kitchen design. The black stainless steel finish that I selected is new for me but I’m a big fan as it’s even more subtle than chrome and picks up on the black accents in this space. If you have any questions about the dishwasher that I didn’t cover, pop them in the comments below and I’ll answer them right away. You can also find more information about the LG QuadWash dishwasher here. *Disclaimer: this dishwasher was gifted but all opinions expressed I this review are my own.